My friend told me about these new hearing implants. What are these all about? In the audiology field, the two most common types of hearing implants we deal with are Cochlear Implants (CIs) and Bone Anchored Hearing Systems (BAHS). Both types of implants are designed for people with specific types of hearing loss, when “traditional” acoustic hearing aids are not the best treatment approach. A Cochlear Implant (CI) is reserved for people with sensorineural hearing loss who are not able to get sufficient benefit from acoustic hearing aids because of the extent of the damage to their inner ear(s). A CI works by stimulating the auditory nerve directly, bypassing the majority of the damaged inner ear. This way of hearing is far different than you would experience with healthy ears, or with hearing aids, because the nerve is being stimulated directly by electrical impulses instead of sound waves. CIs have come a long way since they were first fit in Canada in the early 1980s. 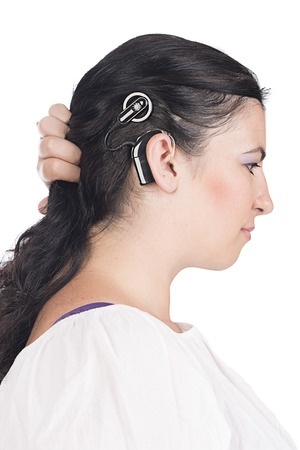 A cochlear implant is the visual equivalent to giving a blind person some of their sight back. It is important to know that this is not a correction to someone's hearing, and it has nothing to do with implanting a new "cochlea" (i.e. inner ear). It gives the brain more auditory information than it had previously. Over time the brain makes sense of this new electrical information - with patience and perseverance the cochlear implant recipient should get better at recognizing sound and hopefully better at interpreting speech. Unfortunately, many individuals who are candidates for CIs are unaware because most people who perform various types of hearing tests and fit hearing aids are unaware of the candidacy criteria, or the referral path, to get a Cochlear Implant Candidacy Assessment. Bone Anchored Hearing Systems (BAHS) are a type of hearing aid designed for people who have anatomical abnormalities that affect how sound enters the ear canal (e.g. microtia), have extensive damage to their middle ear (i.e. eardrum, middle ear bones), or who are completely deaf in one ear (i.e. Single-Sided Deafness). With this type of hearing aid sound gets transmitted directly to the inner ear through the patient’s skull (i.e. “bone”) via a bone conduction, bypassing both the outer and middle ear. The reason this type of hearing aid works is because the inner ears are actually inside the skull. The simplest types of bone anchored hearing devices are worn on a headband (this is often the situation during a trial period to determine potential benefit prior to surgery; headbands are also commonly used with children who are not matured enough anatomically to receive surgery). The best results will be received when the hearing aid is directly connected to the bone - one of the most common ways is via a titanium post that is surgically implanted into the mastoid bone of the skull. The hearing aid is then attached to this post to allow a direct mechanical connection between the hearing aid and the skull. When the hearing aid is removed, this post (referred to as an abutment) is left protruding out of the skin. There are also other types of bone anchored systems other than the abutment and headband - but the concept of bone conduction remains the same. Much like cochlear implants, these types of hearing aids work exceptionally well for potential candidates. However, as with cochlear implants - most people who fit hearing aids and perform various hearing tests are unaware of the candidacy criteria, or the referral path, to get a Bone Anchored Hearing System Candidacy Assessment. Depending on the extent of the hearing loss, an individual might be a candidate for Bimodal Hearing. This means that a cochlear implant or bone anchored hearing aid is used on with ear, in conjunction with an acoustic hearing aid on the other ear – allowing someone to get the benefits of both implanted hearing and natural acoustic hearing. Following a Diagnostic Hearing Assessment you will be advised as to whether you are a potential candidate for a cochlear implant or bone anchored hearing system. Remember that not everyone with hearing loss is a candidate for “traditional” hearing aids. Audiologists are the most qualified hearing professionals to help determine potential candidacy for implantable hearing devices. In Canada there is assistance through healthcare for cochlear implants and bone anchored hearing devices - the surgery, the device itself, and the follow-up. Every province has different policies and coverage in place for CIs and BAHS. Our audiologist can help point you in the right direction if you are a potential candidate for a CI or BAHS.